The fifth wine made in our 250 + year old Palmento (traditional Etnean wine vinification building). Organically grown Nerello Mascalese grapes (90%) were hand harvested from 60-100 year old bush vines grown on the northern face of Mt Etna and transported to our Palmento in Solicchiata. 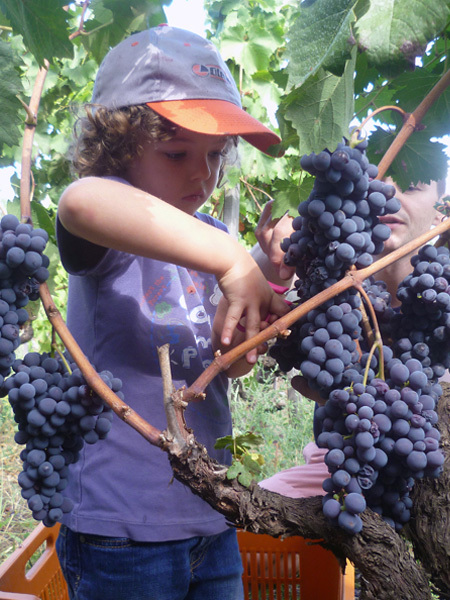 Small amounts of Nerello Cappuccio (2%), Alicante (Grenache) (3%) and the indigenous white grapes, Minella, Catarratto and Grecanico (5% in total) which are co-planted in the Nerello Mascalese vineyards were harvested at the same time and included in the vinification process. 50% of the grapes were de-stemmed by hand, the rest remained as whole bunches. 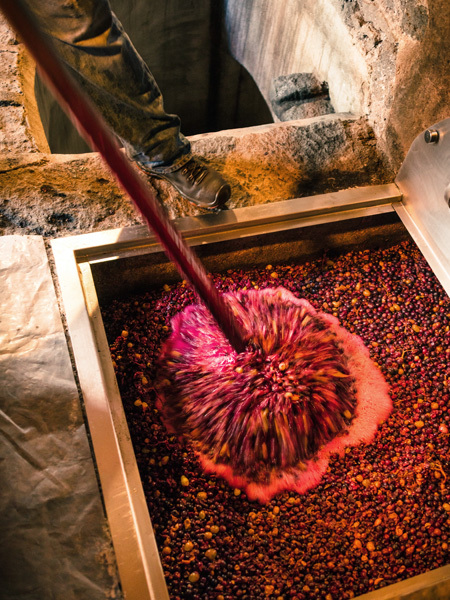 The grapes were macerated for four days, being foot trodden several times. The fermenting must was then pressed and continued fermenting in stainless steel, used oak casks and Georgian qvevris (amphorae) for another two weeks. The wine underwent malolactic fermentation spontaneously. After six months on fine lees the wine was bottled early June 2017 without fining or filtering. Vibrant ruby red in colour, this wine has attractive cherry and wild strawberries aromas with underlying floral notes. The palate is fresh and flavoursome with soft, juicy tannins. The fourth Palmento wine made in our 250 + year old Palmento (traditional Etnean wine building). Predominately Nerello Mascalese, from 60-100 year old bush vines coupled with a small amount of Nerello Cappuccio, Alicante (Grenache) and indigenous white grapes (Minella, Catarratto, Insolia). The grapes were hand harvested and transported to the Palmento. About 50% of the grapes were de-stemmed by the hand, the rest remained as whole bunches. The grapes were macerated for four days, being foot trodden several times. The fermenting must was then pressed and continued fermenting in stainless steel, used oak casks and Georgian qvevris (amphorae). After six months on fine lees the wine was bottled the last week of May 2016 without fining or filtering. Paler in colour than the 2014, this wine is floral with vibrant cherry and wild strawberry aromas. It is flavoursome, with a fresh acidity and soft, juicy tannins. The third wine made in our 250 year old Palmen+o (traditional Etnean winery). Predominantly Nerello Mascalese with a small percentage of Nerello Cappuccio, Alicante (Grenache) and indigenous white grapes (Minella, Catarratto, Insolia). The grapes were hand harvested and transported to the palmen+o. Some of the grapes were de stemmed by hand and the rest left as whole bunches. The grapes were macerated for four days during which time they were trodden by foot several times. The fermenting grape must was then pressed and fermented in a variety of vessels; stainless steel, a large used oak cask and a Georgian qvevri. The resultant wine was aged on fine lees for 7 months before bottling in June without fining or filtering. 2 g/hl of SO2 was added at bottling. Vibrant cherry red in colour. Attractive ripe red fruit aromas (red currants, cherries, wild strawberries). Fresh and juicy on the palate with good acidity and soft, savoury tannins. The second wine made in our 250 year old Palmen+o (traditional Etnean winery). 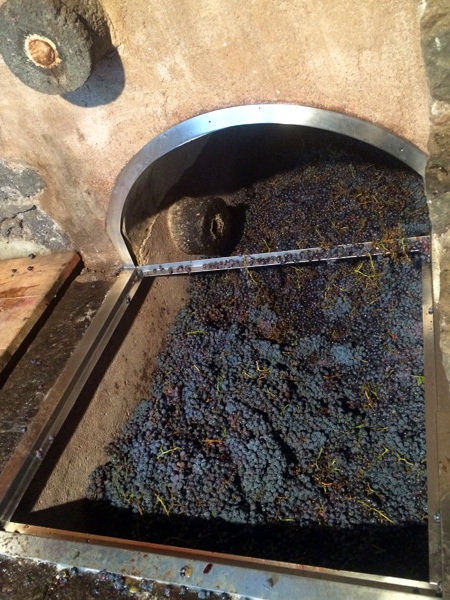 Principally Nerello Mascalese was hand harvested directly into the lava lagare. It was foot trodden in the traditional manner, and left to macerate for 4 days. The fermenting grape must was then pressed and fermented in both stainless steel and a large used oak cask. The resultant wine was aged on fine lees for 12 months. It was bottled without fining or filtering. A small amount of SO2 was added prior to bottling.